Home » Reviews » Survey Junkie Reviews: Is Survey Junkie Legit? Survey Junkie Reviews: Is Survey Junkie Legit? 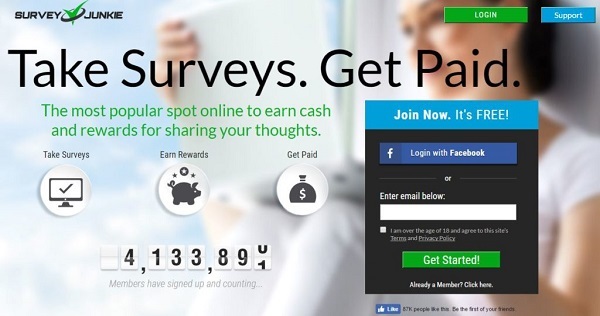 Anyone who has ever tried to work from home, or has wanted to make a little money on the side, has likely come across a lot of sites claiming to pay you for simply taking surveys. With so many out there, it only makes sense that some are scams, some are okay, and some are really good ways to make some extra cash – but which of these is Survey Junkie? Here let’s take a look at Survey Junkie reviews. Survey Junkie is one of many companies that gather data for big corporations, governments, and really any organization that is willing to pay to find out what people are thinking about their products and services, their company branding, and more. Companies can better target consumers if they know more about their personal habits, preferences, and buying practices of a whole bunch of people. This isn’t necessarily a negative thing either. Most companies use data to create products that potential customers want, to improve existing products and services, and yes, this also increases their ability to make money. Some companies use data in a sneaky or dishonest way, but most are just trying to be more relevant and efficient. Survey Junkie is pretty established – for an online survey company – as it’s been around for almost fifteen years. It claims to have over three million members, and to connect big brand companies with the people who might use their products and services: people like you and me. Like all data gathering companies, Survey Junkie needs to find a large number of people willing to give up their time and share personal data. They find a lot of these people by advertising Survey Junkie as a great way to make money on your own time, from anywhere you have an Internet connection, and with minimal effort. Survey companies, in general, can be difficult to understand. It doesn’t seem possible that filling out a survey with your own habits and opinions could possibly be worth the time it takes to do so – not if you’re getting paid for it. The truth is, though, that the business model can work very well. A survey company can gather data from one survey that is useful to more than one company, and so it can sell your data many times over. It might be worth ten or fifteen cents to one company, but if they sell it forty times, they’re making a profit. Multiply that times millions of users, and they’re making a good profit! As their database grows, they become more desirable to the big companies, and can get a better price for the data – even more profit. And so they can pay you for simply answering a few questions, and still build a legitimate company. It might sound too good to be true, and if your expectations are that you’ll make a ton of money while half-watching TV and relaxing on the couch all day, then you will be disappointed. But if what you’re looking for is a good way to make a few extra bucks during your commute, your time off, or here and there to pay for occasional expenses, then you’ll love the kind of opportunity Survey Junkie offers. The first thing to do is to create a profile. This doesn’t cost any money (don’t trust a survey company that charges you to join). They accept people from the States, Canada and Australia. Once your profile is complete, you will be given the chance to complete a number of surveys. Pay varies from $2 for a single, completed survey, to $75. The more details a survey needs, and the longer it is, the more money they will pay for it. You can’t just take all of the highest-paying ones though – you’ll need to qualify for them. You “qualify” for certain surveys by filling out a few demographic questions. This makes sure you fit the group the survey is looking for. Don’t worry if you don’t qualify, as Survey Junkie will still give you points for the time it took to fill out the questions. It might sound like you can run through a dozen $75 surveys each day, but the truth is you won’t – and Survey Junkie is pretty open about that. A big collection of data is very valuable, but your individual data is only worth so much. You’ll be needed when surveys seek to learn more about your particular demographic – people of your age, income, geographical area, religion, gender, hobbies, and so on – but if they are looking for a demographic that you are not a part of, your data isn’t valuable at all to them. You’ll get some good ones, a few really low ones, and probably some in the middle. Don’t be discouraged by this though, because there is value to this kind of work that doesn’t show up immediately, and sometimes isn’t obvious. For example, you don’t have to pay any extra to commute. You can take the time you sit on a bus, heading to your regular job, and make a few dollars – basically gives you a free ride. You could also take the time you would otherwise spend watching TV, waiting for your favorite program to come on, and make some money instead – might even pay for your meals that day. It may not be thousands of dollars a month – more like $50 to $100 – but that doesn’t mean it isn’t worth it. Survey Junkie will give you points for each survey you fill out and will even give some points for completing demographic questions if you fail to qualify for a survey. Once you build up at least a thousand points, you can “cash out” by trading points in for gift cards (emailed, not physical ones), or for cash via PayPal. If you are based in the US, and have an American bank account, you can even get paid by direct deposit to your bank (using Dwolla). You don’t have to cash out at 1,000 either; you can build up your points pool to a much higher number, and then trade them in for a gift card worth a higher amount. New users often won’t hit the $100 in the first month though. The best opportunities generally come along a little later, and some months will simply have more surveys that are looking for information on your demographic – other months might not. Filling in the demographic questions will always increase your chances of better offers too. Survey Junkie will ask for information regarding your technology habits, shopping profile, health, and household situation. The more they know about you, the more surveys they can potentially match to you. Like everything else in life, there are pros and cons to using Survey Junkie. One advantage is that you won’t ever have to deal with getting physical gift cards in the mail, or paper checks, or anything like that. Everything with Survey Junkie is digital, virtually instant, and quite simple to understand. The site is also simple and easy. They’ve designed it well, so you’re never guessing what it is you need to do, or where to find potential surveys to take – it’s all right there within a clean and simple design. You can also cash out pretty quickly. Earn enough points for a $10 payout and you’re good to go. Many other companies require twice that amount, or more. Don’t want gift cards? That’s another cool feature of Survey Junkie: you can get paid in cash, right to your bank account (if you’re in the US) or your PayPal account. That means you aren’t limited to spending your money on Amazon or another online retailer – you can spend it anywhere you like. Yes, there are some of these too. Some rare cases have been reported when payments did not go through – survey-takers did not receive their money when they requested a payout. This is extremely rare, apparently, and though some were able to receive their money after contacting customer service, some did not. More common, is that some users have had their accounts closed, with no apparent reason given. They received any money owing to them, but were shut down from using the service. You may also receive a whole bunch of invitations to surveys that you don’t qualify for. Making sure your profile is complete and detailed will help reduce this, but it will still happen, and can be annoying. The biggest tip we can give is to take the demographic surveys right away. This will help you find more targeted surveys – they will send you better ones – and you’ll earn more money, sooner. It’s also a good idea to open up a junk mail email account – if you don’t already have one. No point in cluttering up your main account. Compare the points offered to the estimated time – a quick survey for fewer points may mean more earnings per hour than a longer one, even if more points are on offer. Do surveys on your phone – it’s not an app, but it’s mobile optimized and is great for making a few bucks while waiting in line, or riding the bus. Do each survey properly. If you rush through, or fake it, the system can tell, and will stop sending you good surveys – or possibly close down your account. Start slow, but steady: two or three surveys a day is a good beginning. You can always build it up later if you have the time.